causes repeated wheezing, breathlessness, chest tightness and night time or early morning coughing. 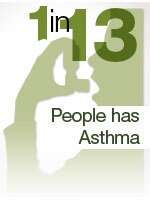 In New York State, more that 1.1 million adults have asthma. Although there is no cure for asthma, asthma attacks can be prevented and controlled with proper care. New York is actively working with health care providers, community coalitions, schools, families and many others to fight asthma so people with asthma can live a full and active life. More information on asthma coming soon.